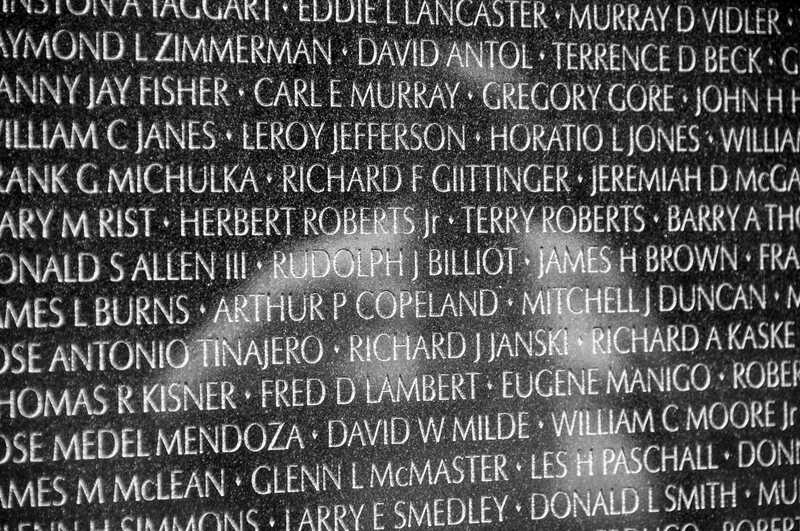 The Vietnam war memorial wall in Washington DC, is a very impressive and thought-provoking work, it holds all the names of U.S. soldiers who died during the war (58,159). But it made me think about how many Vietnamese died in the same war, with a little google search, I found out that if you count both civilians and soldiers, from North and South Vietnam, then the figure is around 5.8 million people. It has to be a reasonably large wall to hold all those names ….. It was pretty hard to get a good photo of the wall, there were many people and the memorial is quite large, but I manage to get this photo. It is a straight out of the box photo, I have only crop it a bit and adjusted the contrast in Photoshop. Vietnam Memorial Wall by Bo47 is licensed under a Creative Commons Attribution-NonCommercial-NoDerivatives 4.0 International License. 2009 Black & White Human Man Memorial Names Nikkor 18-200mm f:3.5-5.6 Nikon D300 North America Reflection USA Wall War Washington D.C.